Picture that time in high school or college when a friend convinced you to do something you were initially opposed to. Perhaps it involved asking someone out, or pulling a prank on another student. Let’s now imagine it was more harmful, and involved drinking underage when your parents were out of town or sampling an illicit substance. Imagine you passed on the initial offer, or even the second or third – how did it feel? Were you the odd person out? Were you laughed at or made fun of by those friends who enjoyed the substance freely? Or maybe you were one of the many who, despite a desire to not engage, let your fear of exclusion take over and override your sense of judgment. Sipping or puffing instead of passing. Social pressures increase the likelihood of going against initial decisions — often times with a dangerous result. Youth are easily influenced by their peers which puts many at risk for dangerous behaviors including drug and alcohol use. To uncover the relationship between peer pressure and self-esteem, we surveyed 1,445 college students in the United States. Our results revealed how social pressures may influence drug and alcohol use. More than one-third of all respondents indicated that their substance use was at least slightly influenced by friends, with 12 percent reporting friends were very or extremely influential. 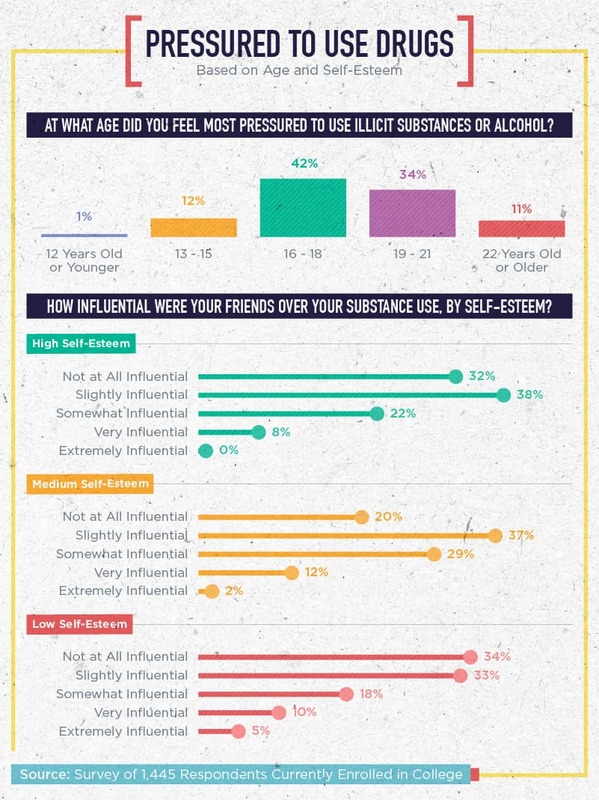 Only a quarter of those surveyed felt friends had no influence on their substance use. Alcohol was the substance most students tied to social influence while marijuana was the second most common substance tried. 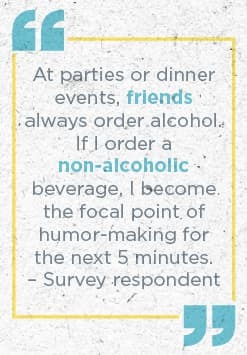 Almost half of respondents shared they used alcohol only when they were with a specific friend or group of friends, indicating that social pressures may play a role in drinking behaviors. In certain scenarios, these pressures can lead to more dangerous activities such as binge drinking — research indicates that binge drinking is often perpetuated through peer influence. Respondents felt that they were most pressured by peers to use drugs and alcohol from 16 to 18 years of age. The American Academy of Child and Adolescent Psychiatry states that perceived pressure comes from a desire to fit in with peer groups and to avoid uncomfortable feelings of isolation and embarrassment. Our survey found that these social pressures affect all college students regardless of their levels of self esteem. Our results found that over 30 percent of all college students reported that their friends were at least “slightly influential” when it came to substance use. For students with low self-esteem, the influence of social pressure is uncertain — while they were most likely to report friends as “extremely influential” in their decision to experiment with substances (5 percent), they were also the most likely to report that friends had no influence on their decision to try a substance (34 percent). Can peer pressure work the other way to discourage drug and alcohol use among friends? Our survey found that 42 percent of respondents were “never” discouraged from using either alcohol or illicit substances and another 30 percent said they were “rarely” discouraged from abstaining from alcohol or drugs. Unfortunately among our respondents peer pressure typically operated in favor of risky behaviors. 40 percent of survey participants shared they are always, often, or sometimes pressured by a friend to drink alcohol or use illicit substances. These pressures can even prevent some from engaging in social events — 14 percent of our respondents indicated that they always or often felt they could not attend certain events without drinking or consuming drugs. Just how deep do social pressures run? 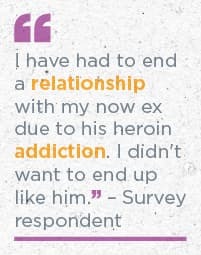 Our survey indicates that for some young people, the decision to abstain from alcohol or drugs can cause tension in friendships. Seventeen percent of our respondents strongly agreed that abstaining from substance use would damage their relationships with friends. These situations may have unfortunate outcomes – according to a study published in 2015, about one-third of 18- to 24-year-olds admitted to the emergency room with severe injuries were under the influence of alcohol. 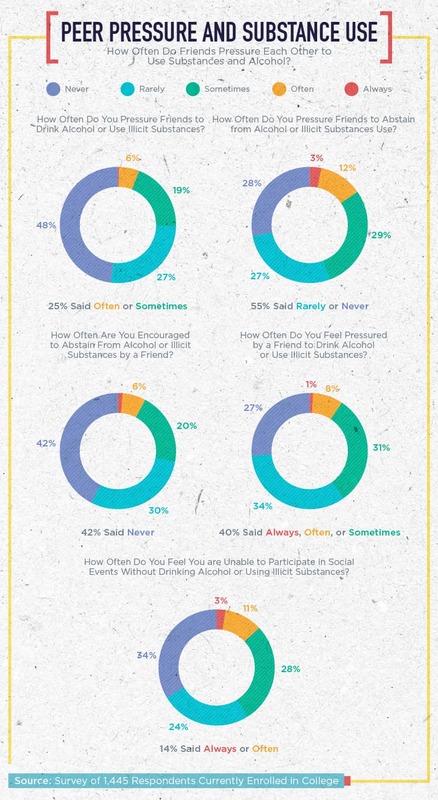 While not all respondents felt that abstaining from alcohol or drugs would damage their friendships, the majority of respondents agreed that substance use was a common social activity – 66 percent agreed or strongly agreed they were more likely to use substances when out with friends. The idea that social activity should involve drugs or alcohol may be reinforced by friends’ photos and posts on social media. Studies show that substance use is introduced at a young age on social media – 90 percent of teens 15 years old or younger will see a friend using drugs or drinking alcohol in a photo online, and 75 percent will be motivated to copy these behaviors. Our survey results indicate that college students may still feel influenced by their friends’ photos and posts beyond their early teen years – 13 percent agree or strongly agree that social media makes it more difficult to resist the temptation of drugs or alcohol. The National Institute on Alcohol Abuse and Alcoholism defines binge drinking as having five or more drinks in a two-hour sitting for men and four or more drinks in a two-hour sitting for women. For students, these settings could be social gatherings, such as parties or game days on college campuses. Whatever the setting, our survey results indicate that drinking is considered a social activity and college students are more likely to over-consume with friends. 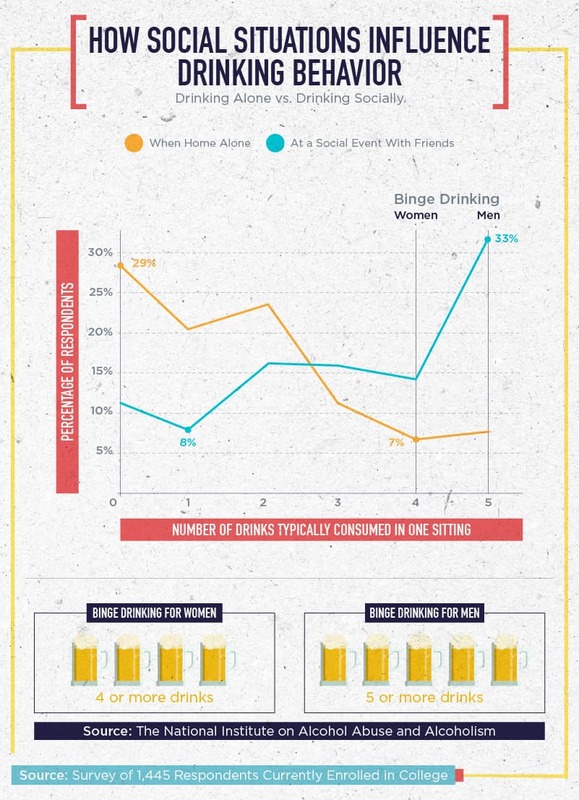 Eight percent of male respondents shared that they would have five or more beverages when drinking alcohol alone – this number jumped significantly for individuals in social environments — with 33 percent noting they would consume 5 or more drinks with friends. For many young adults, the challenge is looking in the mirror and recognizing the severity of their own drinking habits. A theory called Self-Other Discrepancy describes this phenomenon in which students are more likely to associate binge drinking or overintoxcation in a peer than in themselves. Science has also determined that individuals mimic their friend’s drinking patterns in social settings and most do not recognize their copy behaviors. This lack of self-recognition could also play into the prevalence of over-consumption. Peer groups exert a major influence when it comes to substance use. Seventy-five percent of the college students we surveyed were slightly to extremely influenced by a friend to drink alcohol or using an illicit substance. For some, the pressure can be so extreme that they feel their friendships will be jeopardized if they don’t participate in substance use. Educating yourself as a parent to understand the challenges facing young adults and adolescents with substance abuse and behavior issues is important. ProjectKnow.com offers industry leading resources to guide you through information about substance use disorders, alcoholism and treatment options. We surveyed 1,445 respondents from the United States who are currently enrolled in college. 653 respondents identified as female, 782 respondents identified as male, and 10 respondents identified as other. Binge drinking is defined by the National Institute on Alcohol Abuse and Alcoholism as five or more drinks for men and four or more drinks for women in about two hours.